During the first weeks following the explosion at the Deepwater Horizon well in the Gulf of Mexico, oil drifting from the site of the incident usually headed west and northwest to the Mississippi River Delta. But in the third week of May, currents drew some of the oil southeast. According to the National Oceanic and Atmospheric Administration (NOAA), the southward spread increased the chance that the oil would become mixed up with the Loop Current, which might carry the oil toward Florida and the Keys. This pair of sea surface temperature images shows how the warm waters of the Loop Current connect the Gulf of Mexico to the Atlantic Ocean (top image, May 1–8, 2010) and the dynamic northern margin of the Loop Current a week and a half later, on May 18 (bottom image). 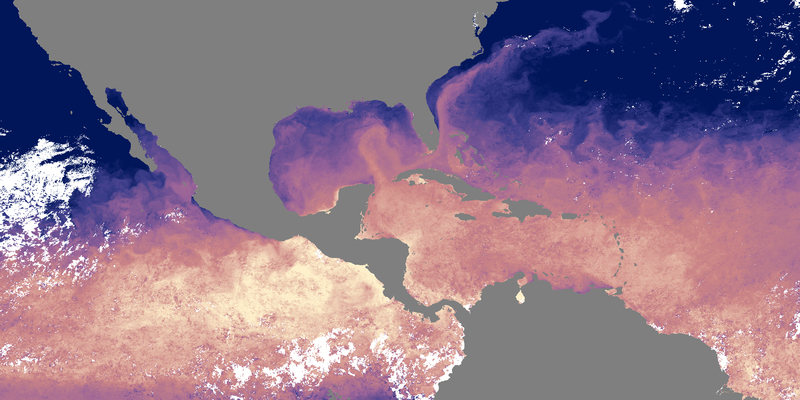 Based on observations of infrared energy collected by the Moderate Resolution Imaging Spectroradiometer (MODIS) on NASA’s Terra satellite, the images show cooler temperatures in blue and purple and warmer temperatures in pink and yellow. Cloudy areas are light gray. Gulf of Mexico Oil Spill Response, the official site of the Deepwater Horizon unified command. Current information about the extent of the oil slick is available from the Office of Response and Restoration at the National Oceanic and Atmosphere Administration. Information about the impact of the oil slick on wildlife is provided by the U.S. Fish and Wildlife Service. NASA Earth Observatory image created by Jesse Allen, using data obtained from the Goddard Level 1 and Atmospheric Archive and Distribution System (LAADS) and Ocean Color Web. Caption by Rebecca Lindsey. 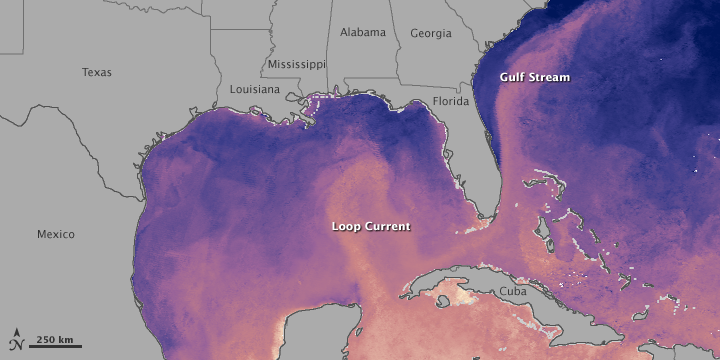 This pair of sea surface temperature images shows how the warm waters of the Loop Current connect the Gulf of Mexico to the Atlantic Ocean and the dynamic northern margin of the current on May 18. 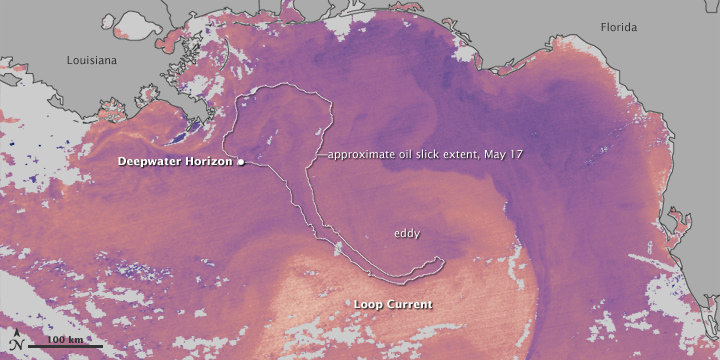 On May 18, NOAA reported that oil was very close to, and perhaps already entrained in, the Loop Current. National Oceanic and Atmospheric Administration. (2010, May 18). 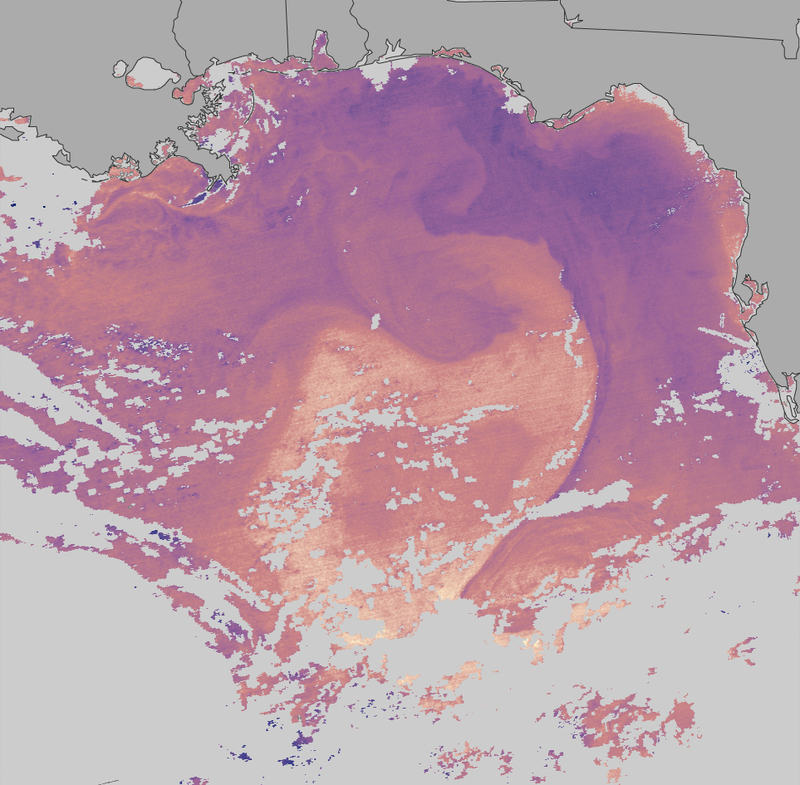 Deepwater Horizon Incident, NOAA Situation Update 18 May 10. Accessed May 19, 2010.